ote with their faith on their sleeves. On the other side, the left wing can sometimes appear hostile to Christianity and those who adhere to the faith. Jesus, not being a respecter of persons, would not be swayed by any of that. So, the question is: Who would Jesus vote for in the upcoming presidential election? I'm sure that the answer to this would vary depending on who you ask. I could take a pretty educated stab at it. However, to try to leave as much bias out of the question as possible, I decided to leave it up to isidewith.com to determine the answer. This site helps people determine which candidate shares the same values that they do - regardless of party. I did my level best to answer the questions based on what the Gospel accounts attribute to Jesus' views. Sometimes, I had to expand the search to other parts of the Bible, but I stuck mostly to the synoptic gospels. There were a number of questions that I had to simply leave blank because there was no way I could determine the correct answer by the Bible. These type of blank answers typically came from very specific questions such as those concerning "common core," or term limits, or other specific contemporary issues. I had to skip more questions than I had hoped, but I would rather leave them blank than try to editorialize an answer for Jesus. Still, there were plenty of questions to paint a pretty clear picture. Here is a summary of what the gospels teach us of Jesus' values. The results of the quiz show that Jesus finds that standing up for the oppressed and those that are taken advantage are very important to him. Few could argue that this is a common theme in his ministry. Jesus also sides toward the traditional which means that he believes in a civilized society that honors traditional morality and values. The gospels point out that even though he has compassion, he remained "sinless." He also quoted Old Testament scriptures a lot and read them in the Temple. The results also show that Jesus strongly believes in showing compassion, empathy, and rehabilitation for small time criminals. The way he dealt with the prostitute and thief on the cross would support this claim. It also shows that he slightly sides with regulation to ensure that business doesn't take advantage of the system and consumers. That conclusion made me picture the anger that he showed at the money changers and how he converted two cheating tax collectors into honest followers. Other items of note in the summary include being against social inequality, corruption and being an environmental centrist. Jesus is more aligned with Bernie Sanders than any other candidate. His beliefs and values are consistent with Sanders' on a 79% of the issues. The closest Republican was John Kasich with a 64%. So these would be the two men he would vote for in their respective primaries. The conclusion makes sense for a number of reasons. Sanders is against corruption of banks and is the champion of the "least of these" as Jesus called them. 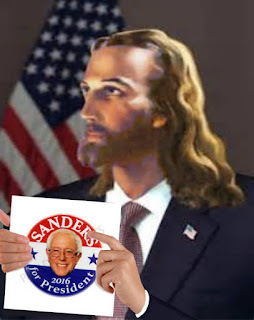 It probably didn't hurt that both Jesus and Bernie are Jewish. 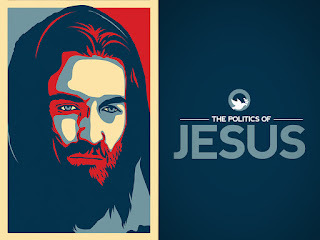 Check out isidewith.com and see who you line up with and see if you see the issues like Jesus does.